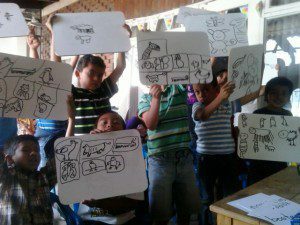 The Guatemala Literacy Program that Linda Henke developed two years ago is going strong. Our first year results demonstrate solid success. We pre and post tested all students using EGRA, an international literacy test, and were delighted that at the end of seven months, our first grade readers demonstrated third grade reading skills. The results pleased the Guatemala Minister of Education so much that she asked us to develop a professional development program that would train many more Guatemala teachers. The video below gives you a sense of our wonderful students and teachers and the small villages where we work. If you would like to know more about GLXi, our funder and parent foundation, go to this website: http://glexchange.org.. You can donate to the program there. Or if you are a shopper on Amazon, please consider signing up for SmileAmazon and donate to GLXi.